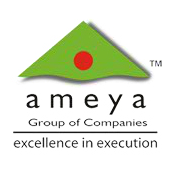 Ameya Group of Co. Established in 1995 since then has immerged as an strong brand with firm foundations spread across in the field of construction with its corporate Office head quartered in Mumbai with branch offices in Pune, Baroda & Nasik. The company today is equipped with team of highly qualified experts & professional several certified MBA, Architect, Civil Engineer, CA, Analyst. Our team is not only knowledgeable, resourceful but also helpful with a mission to ensure customers delight. Ameya reputation has been truly derived from our high standards of quality, perfectionist attitude which has won trust of our clients many of whom we share long-term association. Our Company with team of analyst keeps tap on the pulse of real estate & the financial markets to give 1st hand information to our clients we believe in gains without risk and consistent growth which generate and creates rewards and returns during most difficult times of recession. We stand firm with an aggressive approach and have been tapping on opportunities due to the global recession.